What if our own brains weren’t, in fact, our brains? 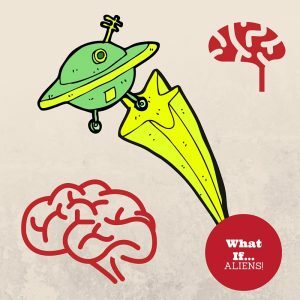 What if, several millennia ago, when the earth was still evolving, and we humans were not quite us humans, yet – what if aliens had visited us then, and planted themselves firmly inside our forming skulls? What if that was the reason we, apart from all other earth life, are sentient? What if that was why we were always so uncertain, so lost; always reaching for that elusive something that would give our lives meaning? No sooner had I pitched out a boatload of ideas that were only weighing me down* did I get the brand new idea for a novel. But not just the general concept – several chapter outlines, a title, a log line, and a synopsis, too! I know I’m trying hard not to start anything new, right now, but this story has really grabbed me, and I’m scared to miss the opportunity, so I’m going to run with it for a while. With all of that in mind, I also had another idea for a story, and this second idea I am not chasing. I will put it down here just to get it out of my mind, however. As always, feel free to resurrect it and make it your own. So, here’s the idea: what if there was an alien invasion of earth, but the aliens didn’t come for us? What if the aliens had, in fact, no interest in humans one way or another but had come with the intention of wiping out something else? This is the part of the story I haven’t got worked out. I don’t know what the ‘something else’ might be. Maybe mosquitoes, or cockroaches, or lint. Maybe tacos. I want to see how that changes the standard tropes of us going to war with them (aliens, I mean, not tacos… though, maybe that could- no. No more plot bunnies! ); the standard thing of always having our own race at the center of everything. Someone write that story. I dare you! A long long time ago*, in a corner of the internet far far away**, I said that the new plan was to clear out some ideas for projects I know I’m never going to finish from the back of my mind, where they only serve as distractions from the real projects I should be focusing on. Well, I’ve been semi-successful in this, so far, but I want to clear out some more, and I’m going to do that right here, right now. 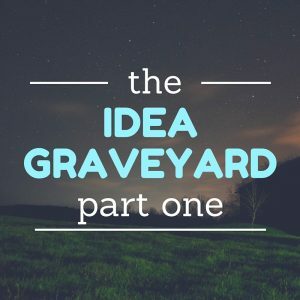 Consider this post a kind of idea graveyard. And hey, if you like the sound of any of my abandoned ideas, then feel free to resurrect them, by all means. I’d love to hear from you if you’re inspired by anything below. Phew. I thought that’d be hard, but it was actually a relief to put all those drafts in my scrap folder.